Geoffrey Hillam Gurr Murray was born in Adelaide, South Australia, on July 1st 1911 to William Priestly Murray, an insurance adjuster, and Agnes Emily Murray of Millswood. Between 1920 and 1928, Geoffrey attended Scotch College, Mitcham, South Australia where he studied subjects relating to agriculture. On completion of his education he then worked as a Jackeroo or Pastoralist on various Stations. His last place of employment prior to enlisting with the Royal Australian Air Force was at Mount Sturt Station, Milparinka, NSW where he worked in the office for a wool firm. In December 1939, Geoffrey went to the RAAF Recruiting Centre in Adelaide to volunteer himself for air crew. It appears that this first application may have been rejected on the grounds that he was under height, he stood 5' 5'' tall! However, in May 1940 a further application was made at No.5 Recruiting Centre in Adelaide, and this time he was accepted. His service in the RAAF commenced on 27th May 1940 when he was aged 28 and he was given the Service Number 407094. The length of service he signed up for was "the duration of the war and twelve months thereafter". Training commenced, and Geoffrey was appointed to No.1 Air Observers School in Cootamundra, NSW, between May and October 1940. From October to mid December 1940 he attended No. 1 Bombing and Gunnery School at Evans Head on the east coast of Australia. December 19th - January 17th 1941 the training continued at No. 1 Air Navigation School at RAAF Station Parkes, New South Wales. No. 1 Air Navigation School was formed on November 1st 1940 operating Avro Anson MkI and de Havilland D H 60G Gipsy Moth aircraft, it was disbanded on December 9th 1943. On January 17th, after completing the course, Geoffrey was awarded his Air Observers Badge. After completion of his training in Australia, Geoffrey was sent to No.1 Embarkation Depot at Ascot Vale in Melbourne, and on February 23rd 1941 set sail for the UK where he arrived on May 5th 1941. On arrival in the UK, he was processed at 3 Personnel Reception Centre at Bournemouth before being sent to 10 OTU (Operational Training Unit) at RAF Abingdon to begin his operational training which he completed by August 27th 1941. Geoffrey's first squadron posting was to 102 Squadron at RAF Topcliffe who were flying Whitley V aircraft. He flew his first operational flight on August 29th 1941, the target for the night was Frankfurt and 18 Whitley's from 102 Squadron participated in the attack. 102 Squadron lost two aircraft that night. On October 25th 1941, Geoffrey was posted from 102 Squadron to 35 Squadron who were based at RAF Linton-on-Ouse. 35 Squadron were flying Halifax aircraft at this time. On November 7th he flew on an operation to Essen. 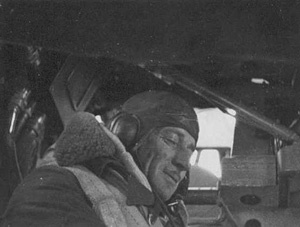 The pilot of the Halifax that night was Sergeant William Bruce Archibald whom Geoffrey then flew with on all future operations. Also onboard that night were Sergeant Archibald McLaren, Sergeant Douglas Francis and Sergeant Samuel 'Pedlar' Palmer all of whom would fly regularly with Geoffrey after this operation and who perished with him in March 1942. Flight Sergeant Geoffrey Murray flew his last operational flight on the night of March 30/31st 1942. The target was the German Battleship Tirpitz which was moored in Fættenfjord in Norway. The Halifax, R9496 TL-L from 35 Squadron , he was in was shot down in the target area with the loss of all onboard. The body of Flight Sergeant Murray was never recovered and he is commemorated on panel 111 of the Runnymede Memorial, Surrey, England.